Author: James Bynon †. Edited by: Harry Stroomer. Series edited by: Harry Stroomer. 12 pp. Roman, 233 pp. The present 11th volume of this series is dedicated to the publication of James Bynon’s dissertation in which the description of weaving techniques plays a central role. 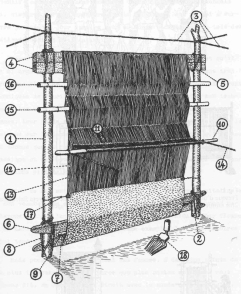 This comparative linguistic work in particular deals with the different components of the weaving technique in the Berber languages of North Africa. The following areas are analysed: Morocco, North Algeria and the Algerian Sahara, Kabylia, the Aurès mountains, Libya and Egypt. The author is a long-standing member of the research group of the renowned School of Oriental and African Studies (SOAS), University of London, where for the last 28 years he devoted his time to study and describe the languages, cultures and art of the Berber peoples. 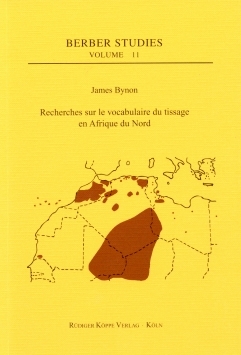 In the 1960s, Bynon prepared his dissertation under supervision of Prof. Lionel Galand (Ecole Nationale des Langues Orientales Vivantes, Paris) and completed it in 1963. Up to now his work had not been published. Nevertheless, berberologists who had the opportunity to cast a glance at it consider Bynons thesis as a standard work within this area. Even after 40 years have passed since its completion it deserves its present publication, not only because of the unique linguistic approach but also because of its solid scientific methodology. A [...] startling knowledge of technology, of history and pre-history of Berber societies, and of Berber linguistics, seem to have been happily combined in order to produce this remarkable volume [...] In any event, this book is a benchmark amongst the studies of the loom and of weaving in North Africa and it should be on the reading list of all who are specifically interested in weaving amongst its sedentary Berber peoples.